Compliance with welding quality standards and the provision of competent welding personnel is becoming an increasing requirement in the engineering/manufacturing sectors. 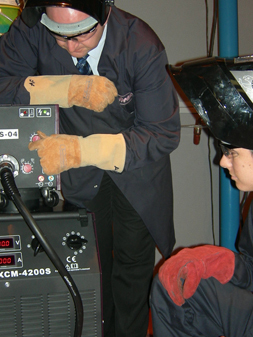 In order to ensure that competent personnel are employed for welding activities, we offer a range of short courses which include refresher training in MIG/MAG, TIG and MMA or upskilling training in accordance with BS 4872-1:1982 or BS 4872-2:1976 for MIG/MAG Brazing and TIG welding and BS1140:1993 for spot welding. The Wilkinson Welding Academy offers the full range of NVQ/(QCF) Qualifications and Apprenticeship/Adult Apprenticeship programmes in Welding or Welding/Fabrication Engineering. are issued with the appropriate Welder Qualification Certificate.